Mix together all the dry ingredients; flour, sugar, salt and yeast in a stand mixer with a dough hook attachment. Beat eggs, add to milk. Add softened butter to stand mixer, followed by egg and milk mixture. Mix until the dough has come together and appears almost smooth to the eye, whilst being pliable yet still slightly springy to the touch. Remove from the mixer and place in a bowl in a warm place, cover the bowl with clingfilm and wait for the dough to double in size. Once the dough has doubled in size – punch down and roll out to approximately 7mm thick. Utilising either a donut cutter ($25 on eBay) or some cookie cutters – cut out donut shapes and set aside for about an hour (or until they’ve doubled in sized again). Whilst you’re waiting for the rise to happen, preheat your oil to 180c. Pick something clean with a high smoke point such as rapeseed oil. Not Olive Oil. Fry your donuts, about 1m 20s per side. Don’t cram too many into your oil, or you’ll shock the oil and you’ll end up with greasy donuts. 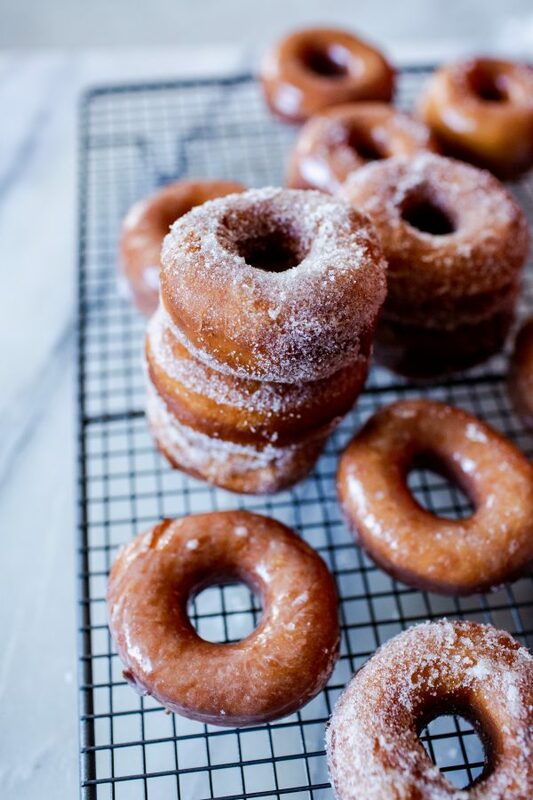 Immediately upon removal from the fryer, toss donuts with vanilla sugar or cover with the glaze mixture. Simply sift in icing sugar into your milk (over a mixing bowl) and stir through regularly, until you have a thick, yet smooth, glaze (like a thick shake). Add vanilla essence to taste. Application is a bit messy. Place a wire rack over a brownie pan and then pour the glaze over the donuts. The brownie pan will catch the runoff, which you’re definitely going to need to reuse – since you’ll want at least two coatings on each donut and a nice even covering. You only need to do one side.